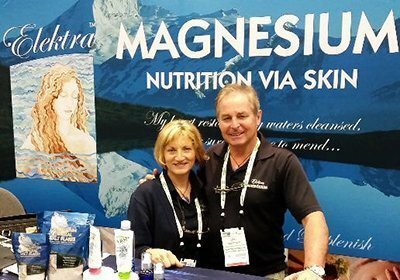 Since 2008 Sandy and Peter Sanderson have built a family business developing natural (chemical-free) transdermal magnesium chloride products for skin care and wellbeing: www.elektramagnesium.com.au Elektra Life Pty Ltd is a family owned Australian company (a.b.n. 54133877693) located at Gold Coast, Queensland, Australia. Elektra Magnesium Chloride Hexahydrate salts (used also in Magnesium4Horses packaging) are naturally evaporated and certified food grade, with Australian laboratory trace mineral analysis showing NO mercury and NO lead contaminants. They show the highest level of elemental magnesium (over 16%) of all the magnesium chlorides in the range (range = 12-16%). These horse owners using our magnesium chloride flakes as equine feed supplement are mostly women who are extremely devoted to their horses, which they treat as their own children. We call them “The Horse Mums”. It all started in 2009 when Pauline Moore, leading expert in horse nutrition in Australia (www.gravelproofhoof.org), approached Elektra Life regarding the use of our magnesium chloride flakes as a horse feed supplement. She explained how horses in Australia are more prone to magnesium deficiency because our soils are deficient and consequently produce grasses high in sugars and low in magnesium. This leads to a high incidence of horse diabetes. She also said that other forms of magnesium commonly used, like magnesium oxide, are difficult for the horse digestive system to assimilate and absorb – and they don’t like the taste either. Pauline trialed our magnesium chloride salts extensively, documenting several cases with photographs and X-ray evidence of healing of the hoof lamina as a result of the use of Elektra Magnesium flakes in the feed. 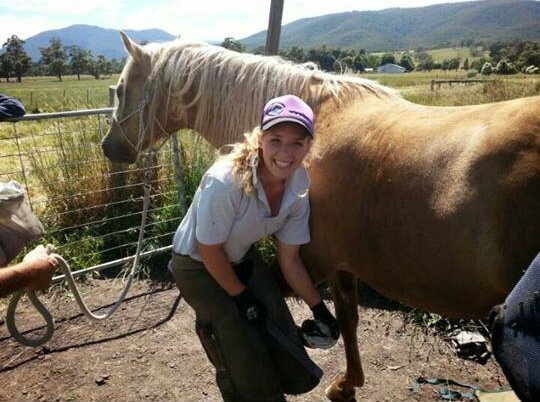 She worked closely with horse podiotherapist Deborah Benstead to develop arguably the most successful natural magnesium supplement feeding system in Australia. Many horse rehab facilities and rescue centres have adopted these protocols with impressive results, bringing horses back to health from the brink where they had been facing a trip to the abattoirs. Over the years the word about these successes spread until an Australia-wide natural health horse community developed with people using this protocol on their horses to achieve optimal health and wellness. Hoof trimmers like Jeané Dekter have realised that horse hooves become much easier to trim (which is more comfortable for the horse) when they have enough magnesium. Healthy hooves lead to better posture and happier horses. The horse flakes packaging was a natural offshoot from the human range of Elektra Magnesium body care products as people seemed to get confused about the original Elektra Magnesium packaging and kept asking if it was okay to use for horses. A different packaging was the ideal solution and in 2016 the magnesium4horses packaging was born. In late 2018 it was upgraded to the present style. The same source of magnesium chloride flakes supplies both brands with the difference only being a slightly thicker flake and a cheaper price. Same salt source, same processor and same food grade certification. 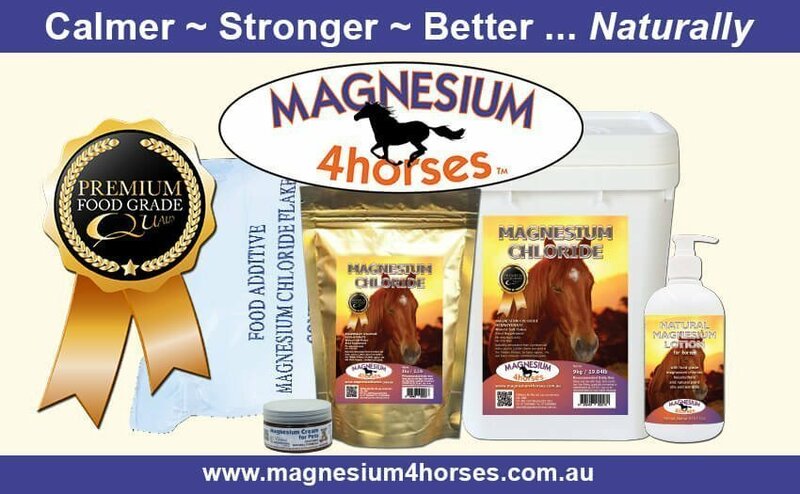 WHOLESALE ENQUIRIES WELCOME: In addition to bulk purchase of the Magnesium4Horses packaging range, 20kg bulk bags are also available for larger scale operations.